Why Commercial Pressure Washing Protects Business Investment. When it comes to your business, first impressions really do matter, so you need to make sure you’re always creating a great one. Without adhering to a consistent professional cleaning program, your business can quickly take on a dirty appearance, turning off potential customers and cost you critical sales. 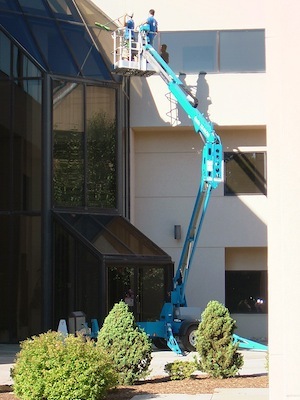 To help you avoid this common issue, All County Window Cleaning has provided a helpful guide to why commercial pressure washing and rust removal is an important investment for your business. Concrete surfaces, such as building exteriors and sidewalks, are highly vulnerable to dirt, oil, grease, and environmental pollution, particularly during the harsh winter months. These unwanted substances can wreak havoc on your business, causing permanent damage to the exterior surfaces. A pressure washer will help keep your business’s exterior looking like new. This powerful cleaning method draws water from a reservoir to remove the toughest dirt, rust, grime, and mildew from buildings. pressure washingMaintaining a clean, professional appearance is key to your business’s success. Whether you’re a property manager or a family-owned and -operated commercial building, professional pressure washing and rust removal will help you maintain a clean, professional exterior for your clients. Without a regular exterior cleaning, your building can accumulate dirt quickly, leading to a need for costly repairs. Between cracks developing from mold and mildew to damaged gutters and algae-buildup on the ground, excess dirt buildup can greatly outweigh the cost of regular maintenance. Save yourself the trouble by investing in annual or semi-annual cleaning for your business. If you’re looking for professional pressure washing and rust removal for your business, put your trust in All County Window Cleaning in Vernon Township. With over 20 years of experience providing everything from residential to commercial window cleaning for clients throughout Upstate New York and Northern New Jersey, they’ll help ensure that your business continues to thrive. To schedule a free site analysis today, give them a call at (973) 827-8311 or click here to contact us.